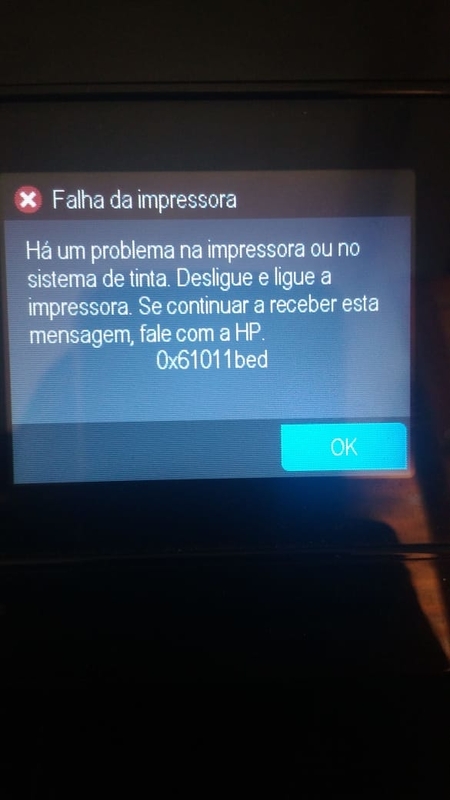 BOA TARDE, TENHO UMA IMPRESSORA HP OFFICEJET 7510 E A MESMA ESTA APARECENDO A SEGUINTE MENSAGEM HÁ UM PROBLEMA NA IMPRESSORA OU NO SISTEMA DE TINTA. DESLIGUE E LINGUE A IMPRESSORA. SE CONTINUAR A RECEBER ESSA MENSAGEM, FALE COM HP. 0X61011BET. ALGUÉM SABE MIM INFORMAR O QUE SEJA. AGRADEÇO SE ALGUÉM MIM RESPONDER.